I have a very good directors on site at the two larger hospitals that run the day-to-day operations. That really has helped me to focus on the strategy of the health systems so that I could be more engaged at the executive level to make sure that what we were doing from an IS standpoint supported the business needs of both ministries. We’re a very unique company and it’s a wonderful organization. On paper, it looks like it might be complicated, but in reality, it works very well. Within Ascension we’re doing a standard model, which helps for us to start standardizing across the health systems so we can do more data analysis and do more focus on population health. I think our biggest thing, not just for the physicians but the organization as a whole, is just the amount of change that they’ll have to do so quickly. Because the project is not one you can ease into. You can’t do a rolling implementation — it’s flip a switch and you’re on it. Gamble: Hi Kathy, thanks so much for your time this morning. Ross: Good morning, Kate. Thank you. Gamble: To get things started, can you just give some basic information about Sacred Heart — what you have in terms of hospitals, bed size, ambulatory offerings, things like that? Ross: Actually I have two health systems. We’re part of Ascension Health, so I have Sacred Heart Health System based in Pensacola, Florida, and I also have Providence Health System that’s based in Mobile, Alabama. So that is termed the Gulf Coast market. I have three hospitals that belong to the Sacred Heart Health System, one is in Pensacola, one is in Emerald Coast, which is in Sandestin area, and one is in Port St. Joe, which down on the gulf. Also, as I mentioned, we have the one hospital in Mobile, Alabama. The primary hospital in Pensacola is about 478 beds, and the smaller hospital in Emerald Coast is about 75 beds. We have like a safety net hospital or critical access hospital in the gulf that’s 19 beds, and Providence is right around 350 beds. Gamble: So how does that work for you as far as splitting your time among the different facilities? Ross: Originally, it was very challenging. I’ve been doing it now for almost six years and we operated totally independently. Even though both health system were part of Ascension, they still operated locally as independents, so I had two sets of executives, two sets of IS steering committees — it was a challenge initially. Fortunately, I have a very good directors on site at the two larger hospitals that run the day-to-day operations. That really has helped me to focus on the strategy of the health systems so that I could be more engaged at the executive level to make sure that what we were doing from an IS standpoint supported the business needs of both ministries. As time went on, it got much, much easier because I’ve built the relationships and I understood what the needs of the organizations individually were, so it made it a lot easier. As of this January, we are operating now with Providence as a gulf coast market, so we will be more aligned with the business needs and functions between Providence Health System and Sacred Heart, and so I anticipate that’s going to be even easier than it has been so far. Not to say it’s easy, but it will be easier. Gamble: And how long have you been in this role? Ross: I have been at Sacred Heart as a CIO for a little over eight years. And I’ve been the CIO for the gulf coast market for six years this July. Gamble: When you took on that role, was there an understanding that it was a big priority to get the gulf coast market to start operating less locally and more as one organization? Ross: From an IS standpoint, yes, and that’s because the distance is not great — we’re only an one and a half from Providence, and from Sacred Heart’s main hospital to the one in Sandestin is about the same distance. So the distance was not that great. We have a lot of people that lived in between Pensacola and Mobile and an area called Daphne, so it made it much easier for me to operate the IS department as a single department. I was actually one of the first departments or functionalities to do that. Since then, we created shared executives now for HR, for legal, and other services that start with IS. And Ascension as a whole now really looks at the gulf as a market, and we’re working more in alignment. That wasn’t because of the IS starting it; that was because, like I said before, we’re so close that it makes more business sense for us to operate together. Gamble: Did you have a role in putting in the directors who are on site at those different sites? Ross: Yes, I hired both of them. We have a great staff. That’s one of the things that has made it so successful for me to be able to do it for both locations — it’s because of not just the directors, but the staff that support them. We have an amazing staff. 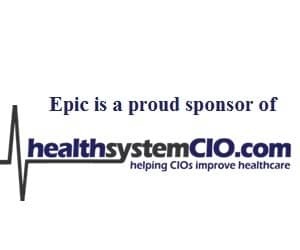 Gamble: Now, in terms of Ascension Health, how does that work as far as governance structure — do you report to a CIO on the system level? Ross: We do. The way that the IS functionality works within Ascension is we’re a separate subsidiary, so we’re kind of like an IS company within Ascension. We have a CEO that’s the national CIO, if you will, and we have two regional CIOs, and I report to a regional CIO. Gamble: So that’s pretty unique how Ascension is structured. Ross: It is. We’re a very unique company and it’s a wonderful organization. On paper, it looks like it might be complicated, but in reality, it works very well. Gamble: Right. So for the hospitals that are part of Sacred Heart and Providence, what type of EHR systems are being used? Ross: We’re currently in the process of doing a forklift replacement of both our EHRs for the inpatient. We currently have McKesson Horizon, and that system will be sunset in 2018, so we are now moving to Cerner, which is generally the direction that we’re going in from Ascension because the majority of the organization has Cerner. We just kicked that project off this month and we’ve got a challenging 12 months ahead of us. Gamble: So at this point, how does it look like that’s going to be mapped out? Ross: It looks like it’s going to be a 12- to 15-month implementation. Primarily the reason that it can be so quick is because we’re replacing everything and going to a standardized platform called OneChart. Within Ascension we’re doing a standard model, which helps for us to start standardizing across the health systems so we can do more data analysis and do more focus on population health across all of our ministries. We currently have two health systems that are on the Cerner OneChart. And we have three health systems in this group: Birmingham, Mobile and Pensacola, that we’re doing as a single project. Gamble: Is there a decent amount of communication with the health systems that are already on it? Ross: Oh yes, absolutely. That’s the great thing about being within Ascension — we are very helpful. We’re family, everybody helps everybody. Gamble: And I would imagine that because there are so many hospitals, you could pinpoint a hospital that’s somewhat near the size and the scope of yours and see what challenges they had and how to work through those? Ross: Absolutely. And with us starting on the OneChart, even though we have two health systems, not everybody is the same. I think we’re going to be the first one that will have a large children’s focus. We have a children’s hospital within our hospital, so as we go up on that system, we will be helping with the future sites that have children’s focus. Gamble: As far as the forklift replacement, I know it’s hard to say, but what do you anticipate will be maybe the toughest part or the most time-consuming aspect of that? Ross: I think the biggest part is just managing the change that’s going to be required and the business interruption. We’ve had an EHR in the hospitals for years. Our physicians have been using CPOE for years and they’re very comfortable with it — no matter whether they like it or not, they’re comfortable. I think the biggest thing will be just the change. Humans inherently don’t like change; I think that’s going to be your biggest obstacle. I think we’re going to have some challenges where the system will work better in some cases and not as well in some cases, so we’ll have to work through that. But really, I think our biggest thing, not just for the physicians but the organization as a whole, because it will impact everyone, is just the amount of change that they’ll have to do so quickly. Because the project is not one where you can ease into. You can’t do a rolling implementation — it’s flip a switch and you’re on it, so I think that’s going to be the biggest challenge.